Wish you were here! You could see the Manatees! So close you can see their whiskers as they look up at you. 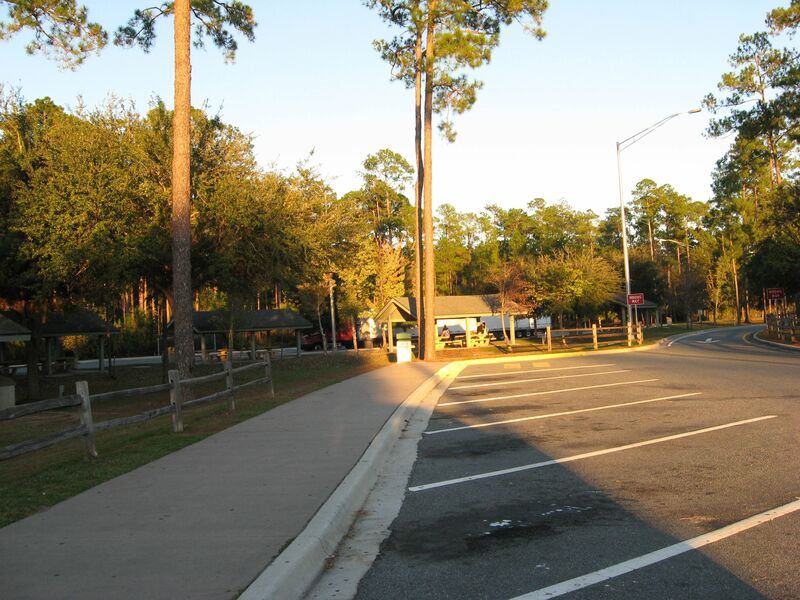 Park officials actually have to tell you to not try to pet them. 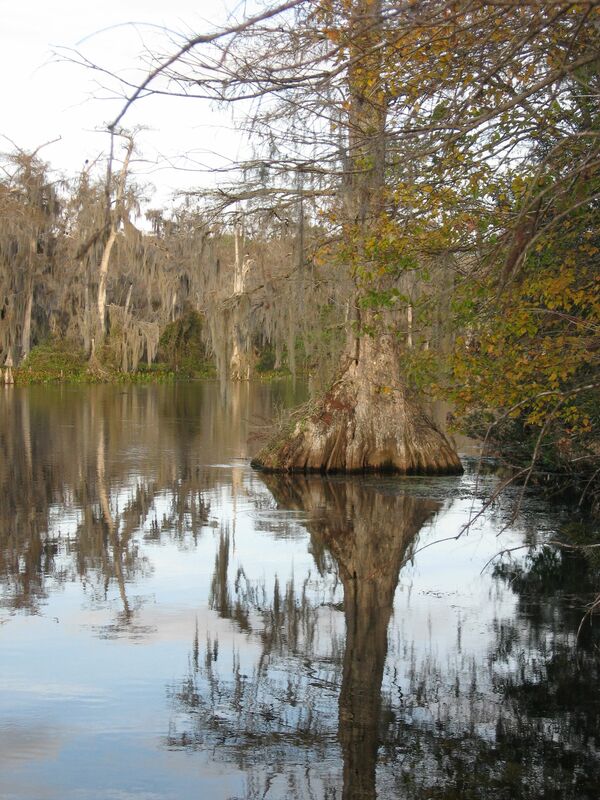 You would love the Bald Cypress trees. 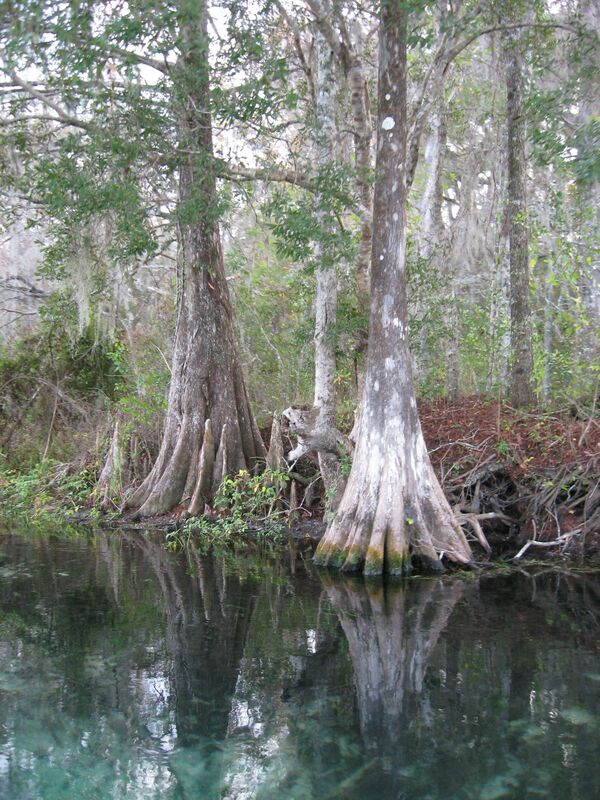 There are magnificent specimens on the Wakulla River- we saw one that was 500 years young. So young that it could be expected to live another 500+ years in optimal conditions. 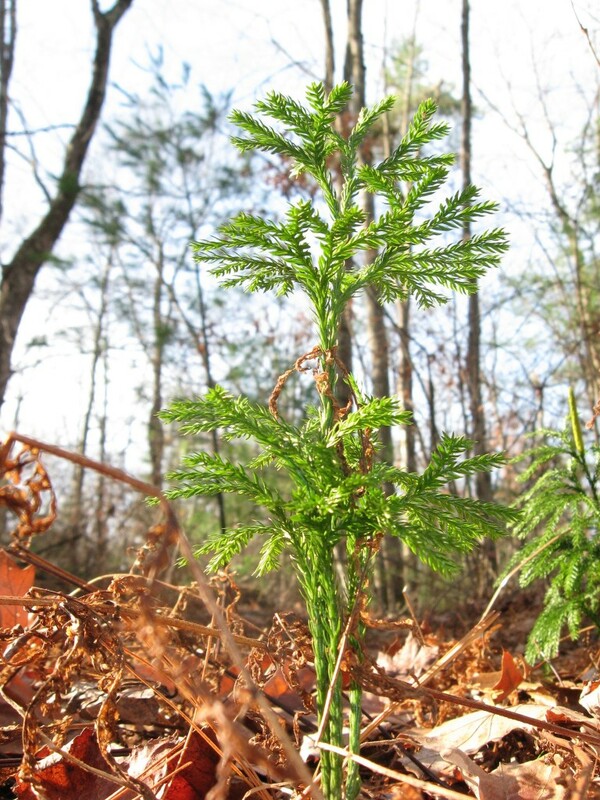 It is called a Bald Cypress because it is a conifer that sheds its needles in the winter. The tree needs moving water to survive. 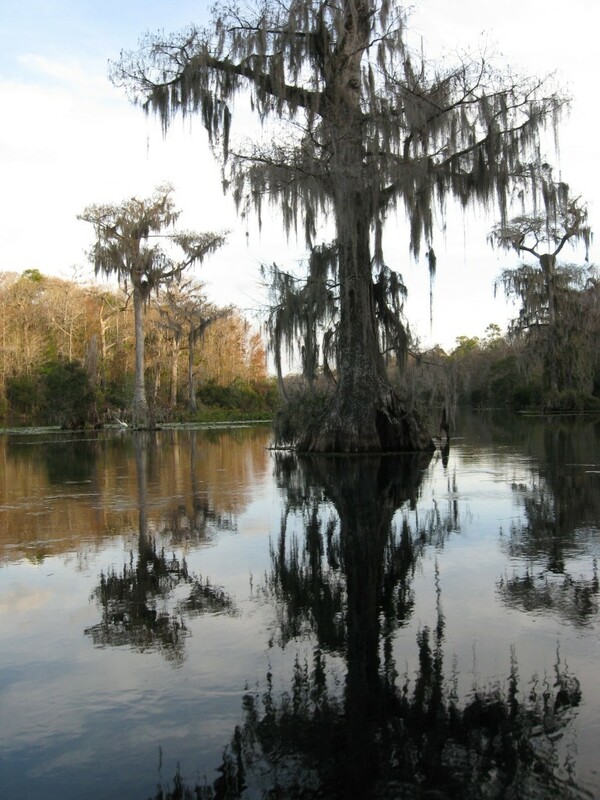 In areas of stagnant water, a tree called the Pond Cypress grows. There is a debate in the scientific community on whether the Pond Cypress is a separate species from Bald Cypress or just a sub-species. 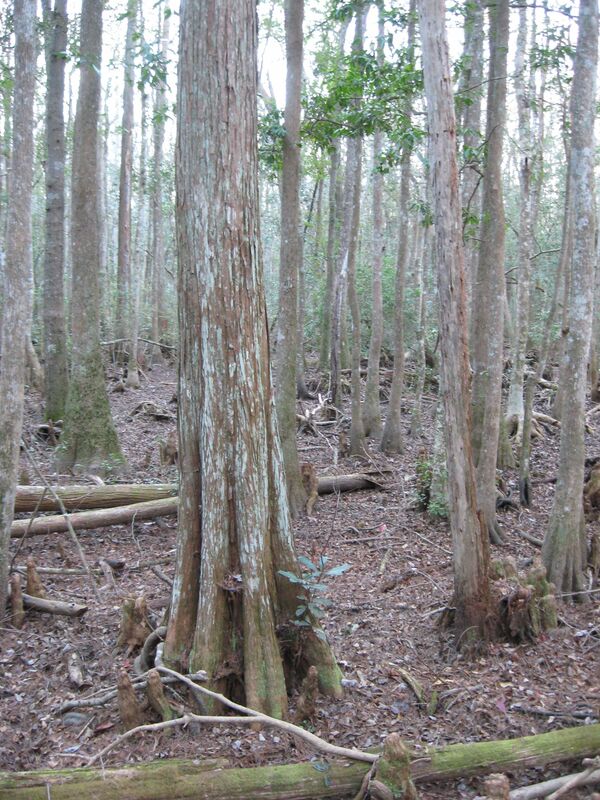 One day, the Sanguine Root hopes to find a Pond Cypress in the great woods of the American South. 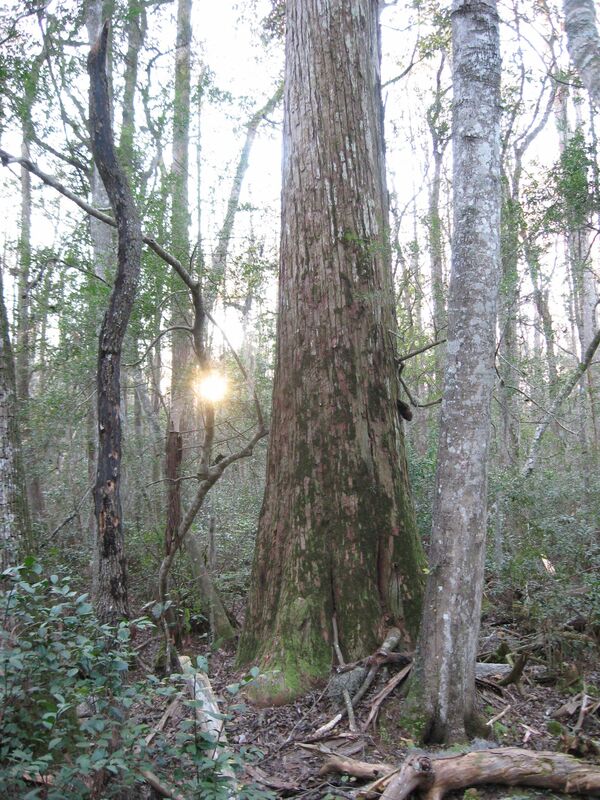 Outside of its natural range, the Bald Cypress, when cultivated will survive, but not be able to reproduce. The Bald Cypress has become fashionable as an urban street tree as well as a garden specimen. 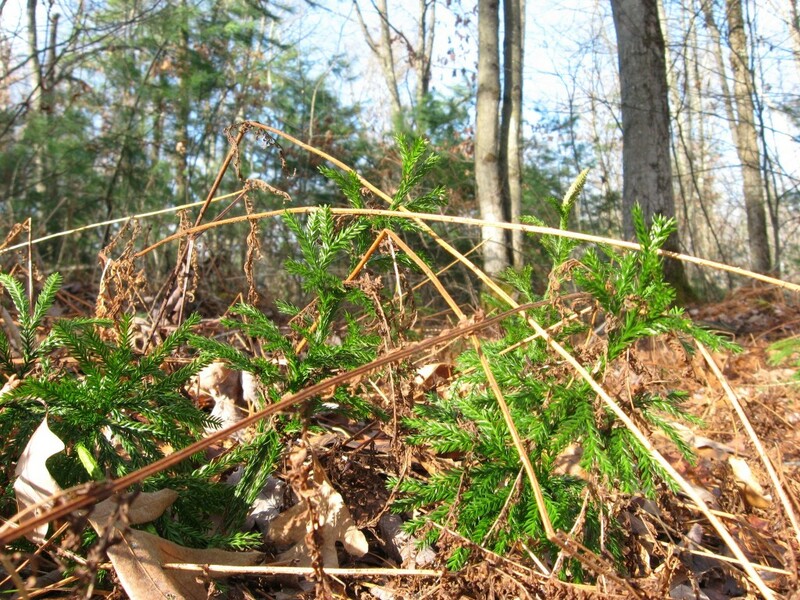 In fact, just footsteps from the Sanguine Root’s Parkside office in West Philadelphia, Pennsylvania is a Bald Cypress! 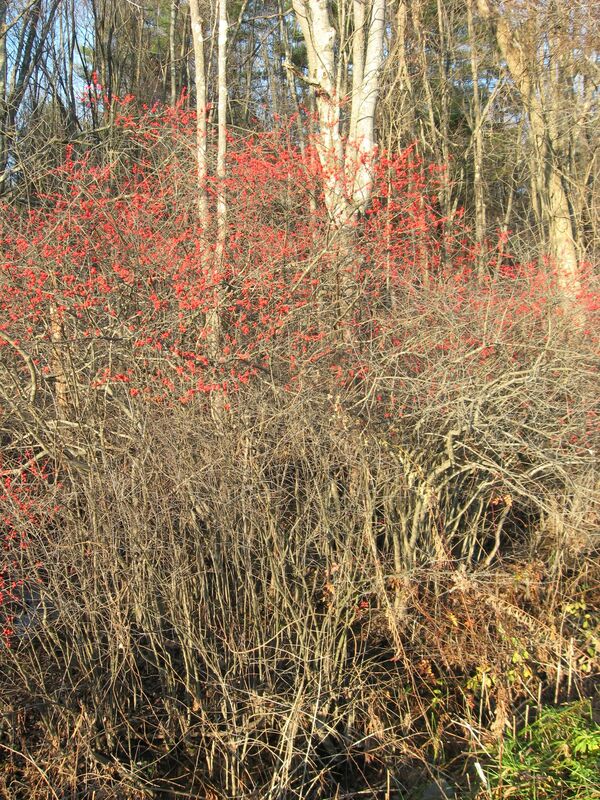 This specimen was most likely planted, being that the utmost northern edge of its natural range is in southern Delaware, about 100 miles south. If you live in Philadelphia, or are visiting and want to see, it is located on the south shore of Centennial Lake near Belmont Avenue. 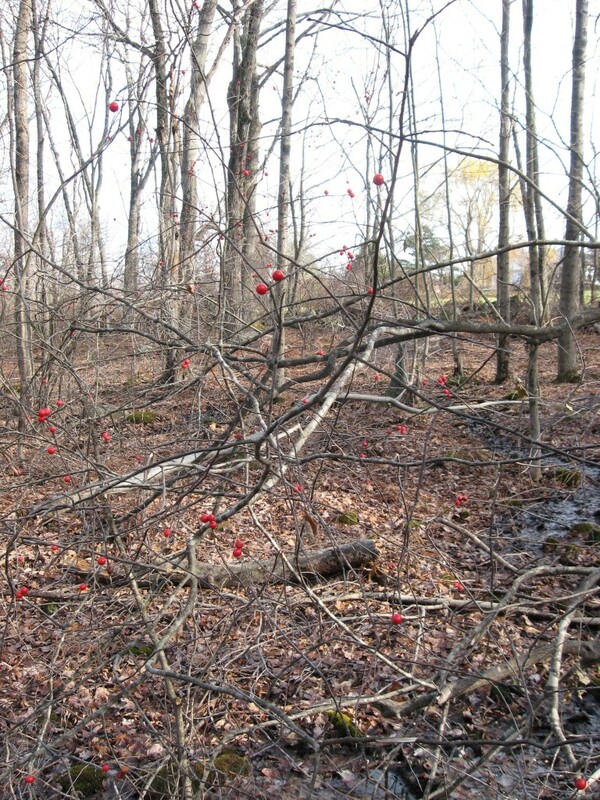 Ancient remnants of them have been pulled out of swamps in New Jersey. You would love to see the Anhinga bird, but here it is pictured for you. This bird loves to hunt for amphibians below the surface of the water and it will dive down to get them, moving through the water with ease, with just its head sticking out of the surface. It is able to do this because its feathers do not shed water easily, which allows it to sink in easily and stay down so it can hunt. A duck’s feathers shed water so easily that they cannot sink into the water and hunt as easily, because they are so lightweight and their bouyancy keeps them afloat. Birds are so light that it is difficult to be submerged in water at all. A duck is so light it is unlikely to go completely underwater to fetch a fish! The Anhinga, however, are able to soak up enough water in their feathers that they can sink down and hunt for the fish and amphibians below the surface. But then again, nothing comes easy. The bird has to address the issue of waterlogged wings, hopefully after its meal has been achieved. Meal or not, the Anhinga has to get up in the last bits of sun and sit still with its wings spread all the way out so they can dry. The wet wings if not dried out could lead to a whole host of problems, most likely beginning with mold and moving on from there. The picture above is a classic Anhinga pose- drying out its wings. You would love to have seen the picture above in person, but here it is. If you like Turkey Vultures (Cathartes aura), this is the place. A tree full of them is a breathtaking sight. 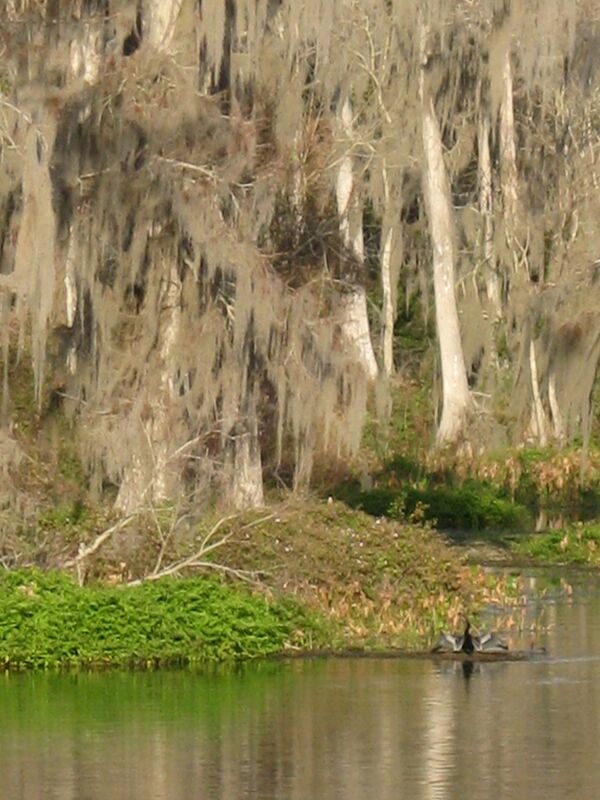 In Wakulla Springs, they often share a tree with the Anhinga. In the above picture, along the water level, you will see some protrusions circling the Bald Cypress the Turkey Vultures are perched upon. You may notice in this particular picture how clearly these protrusions seem equally spaced in a circular fashion about the tree. These are indeed a part of the Bald Cypress tree. 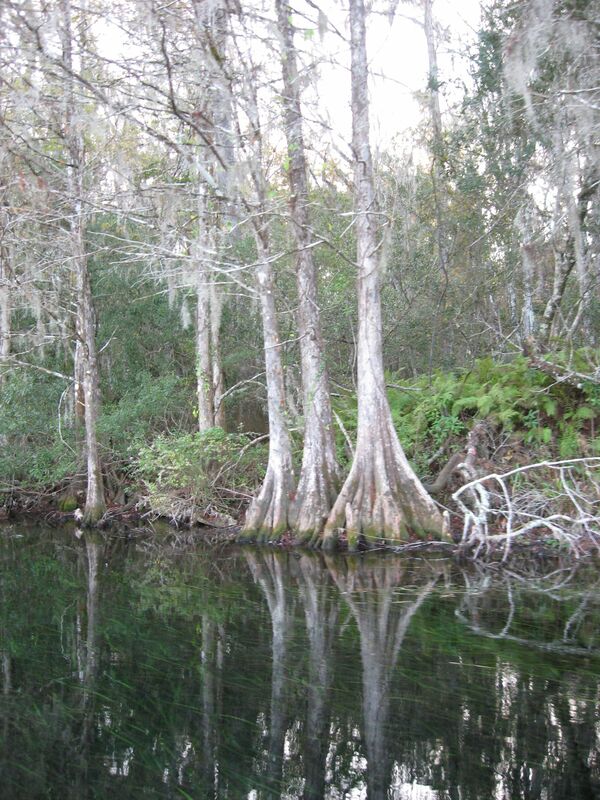 These protrusions, two to three feet above the water are called knees, and are a unique and distinguishing aspect of the Bald Cypress tree, aside from its buttressed trunks and seasonal defoliation of it needles. 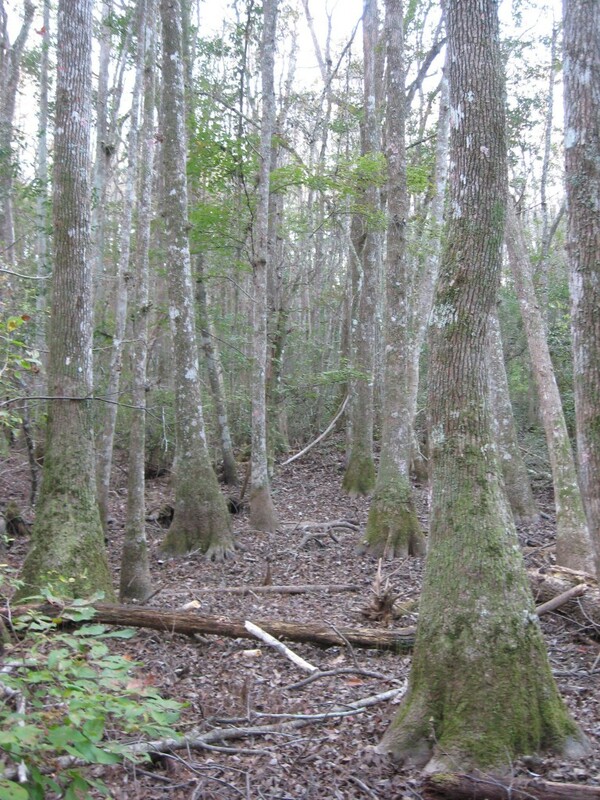 The Knees are growing out of the shallow root systems of the Bald Cypress. 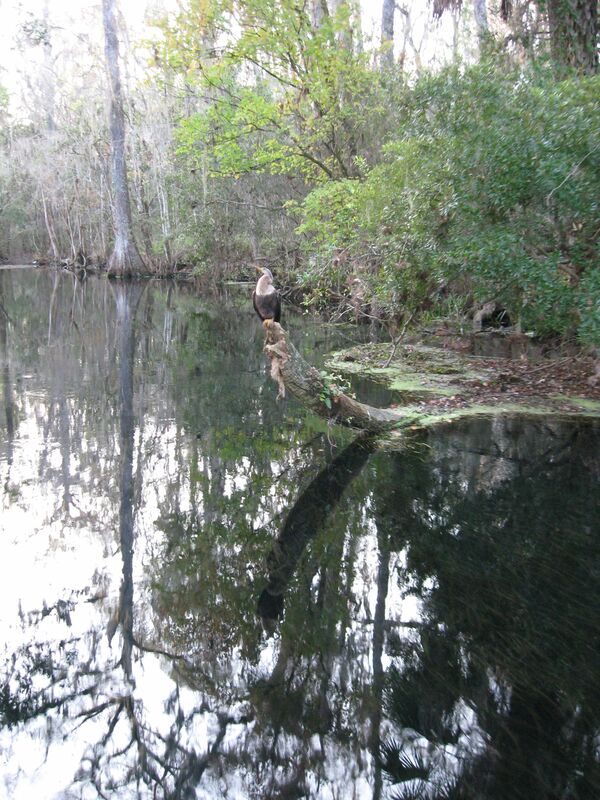 From the above photograph, it can be easily ascertained that these knees are performing some vital function to the tree- like with the water-penetrating feathers of the Anhinga or the water-resisting feathers of the duck. Exactly what this function is, is still a matter of debate. The conventional wisdom is that the knees provide much needed oxygen to the tree during times of flood. 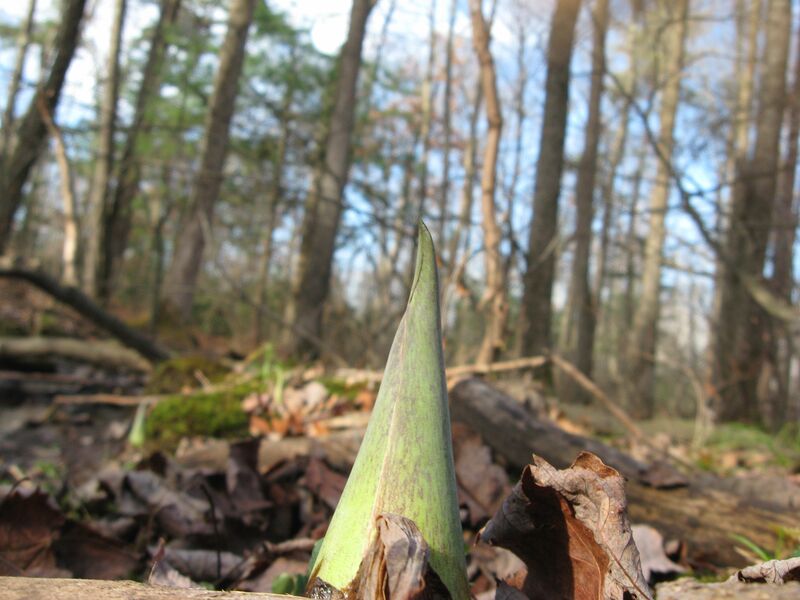 Scientists have chopped off all of the knees of trees and watched them survive through floods, thus creating a challenge to this ongoing theory. Now there is alot of talk about how the knees are actually a structural supporting system, especially for hurricanes, which the Bald Cypress has a strong track record of surviving. Looking at the picture above, from a structural point of view, this new theory has some weight. Just look at how this structure encircles the tree, with the vertical members providing a stiffness to the tree that conventional roots could not- a stiffening that could perhaps survive powerful and unrelenting hurricane winds. With all of this in mind, perhaps the oxygen theory also is true-the survival strategy of any species is multi-faceted. Trees can die from having their roots covered and choked off from the air. You would love this debate that is going on down here. 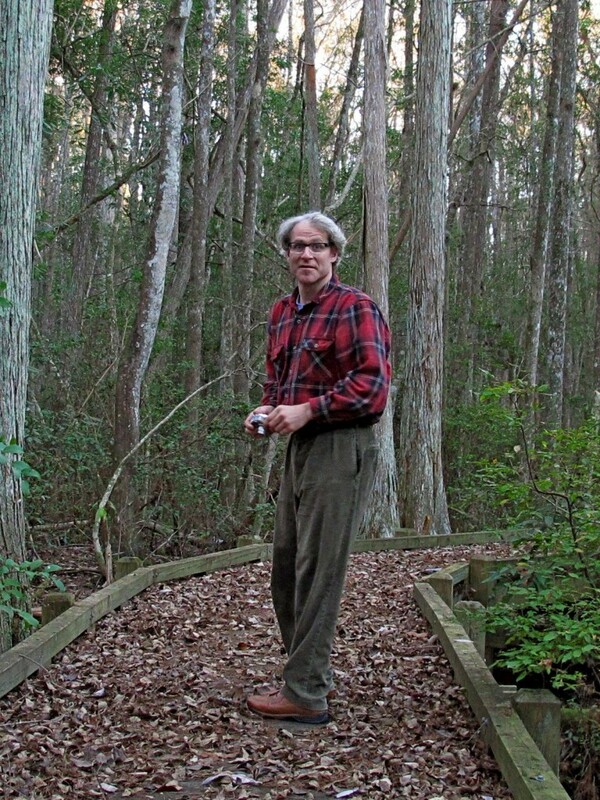 Can we solve once and for all the question of the Bald Cypress Knees? 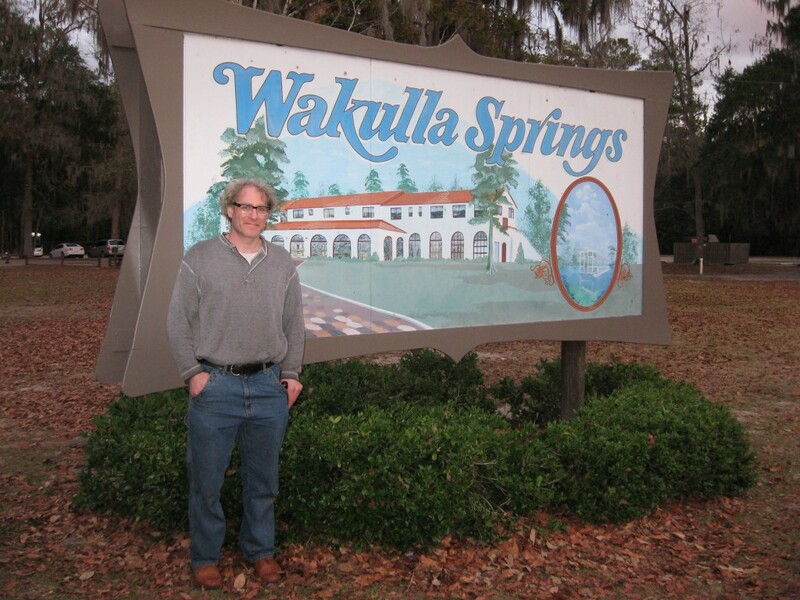 Come on down to Wakulla Springs and lets think about it! Saving the most unique and precious for last, you would love to see the Manatees! They were the reason we came down here. Here we have a species of mammals that at last count is numbered in the thousands- around 4000 specimens minimum. That would be every member of this species existing on our planet. 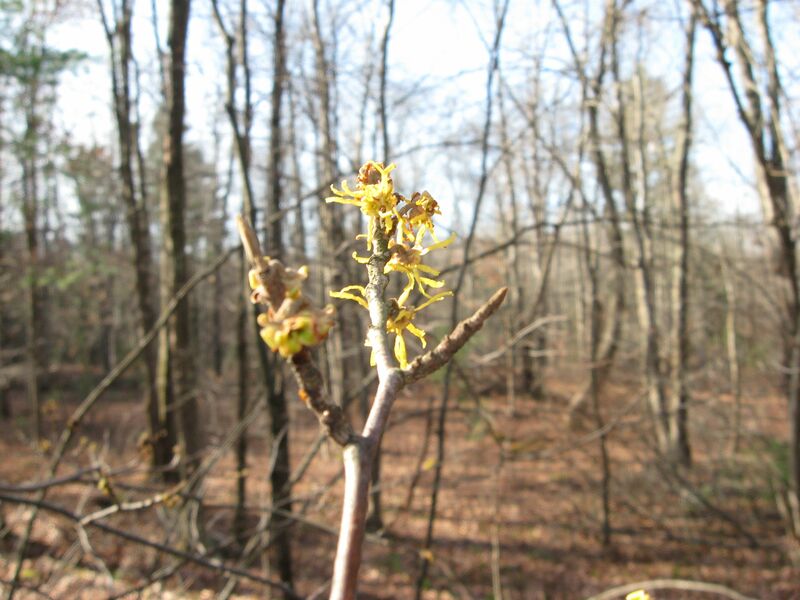 To be able to see the actual specimens in their ecosystem is a special occasion. 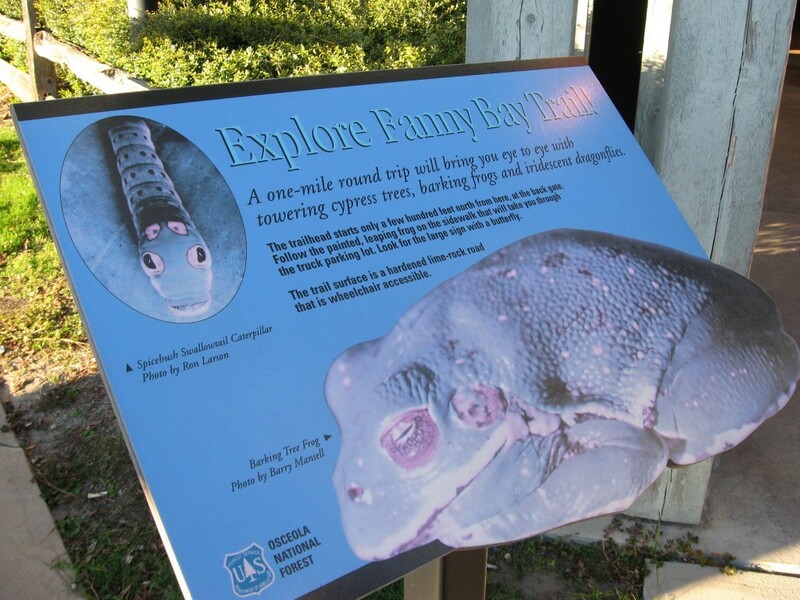 Thanks to Cathy Smith, a Tallahassee Florida schoolteacher who educates her students on the manatees that live just miles from her student’s homes, this experience was made possible. Cathy’s familiarity with Wakulla Springs and the many species of birds and plants that inhabit the area was also a great help in getting oriented to this fantastic environment. 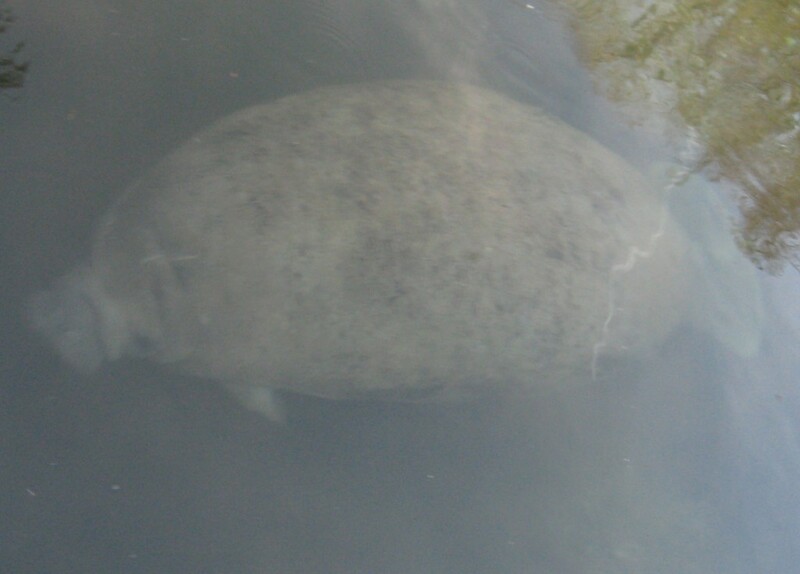 Above, a Manatee is outfitted with an antenna and gps (global positioning system). This is a serious matter when this device is employed for scientific purposes. This is a species that is facing extinction. The white markings seen just above the device’s strap are scars, most likely from contact with a watercraft. Many of the Manatees we saw had these scars. This is a common cause of injury and death for them. 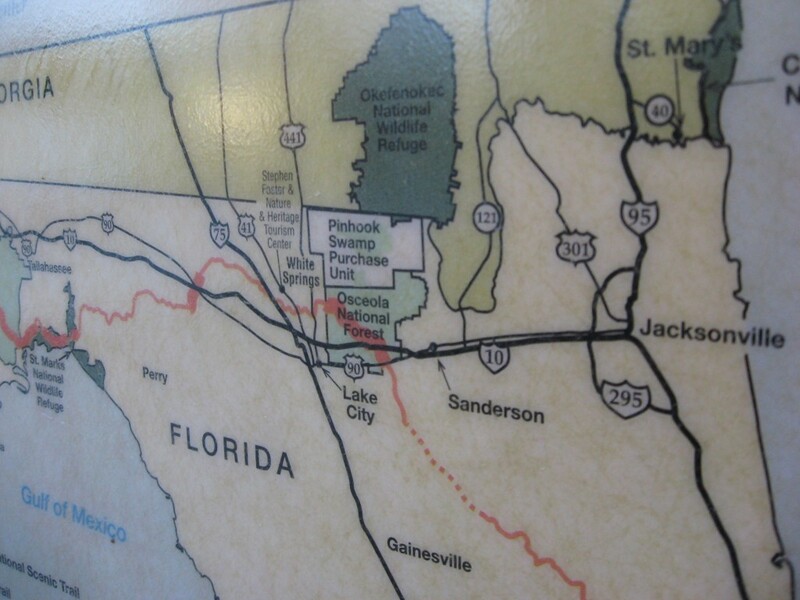 The gps device has been tested and purportedly does not interfere with the ongoing daily activities of the Manatee. 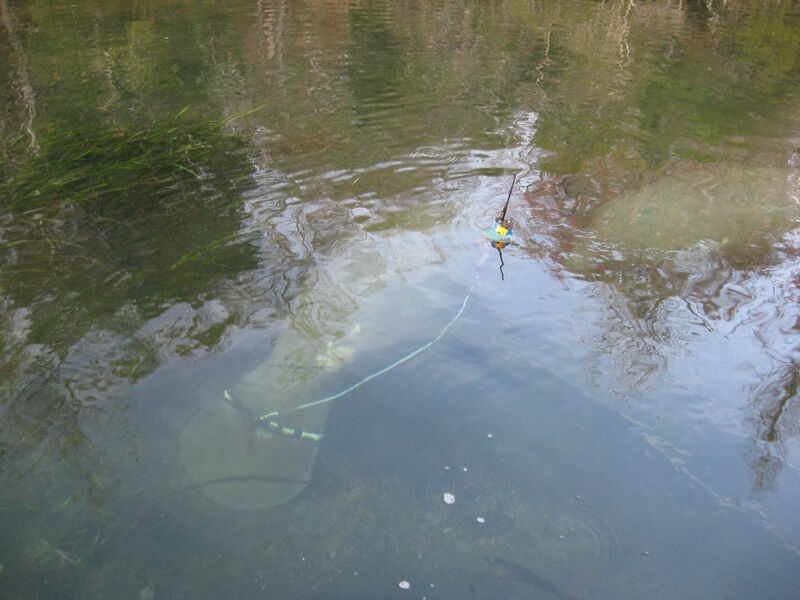 Since this device has been installed, the Manatees have been traced to go all the way to Massachusetts in the summer. 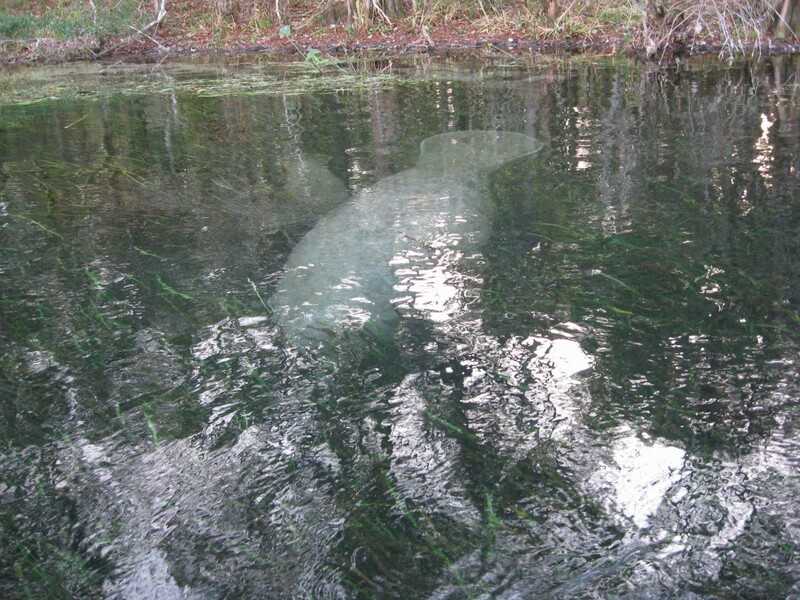 The whole lives of Manatees can be monitored in a way never done before. With a species at the edge of survival, this intervention is necessary and can help us humans guide the path of action for the next decades. Our species has very possibly the means to allow the species of Manatees to survive. Counting the Manatees is an important ongoing effort to gauge their population stability. We have no idea how many Manatees existed 50 years ago, because they were not counted. The picture above was a unique moment for Sanguine Root staff photographer Sean Solomon. 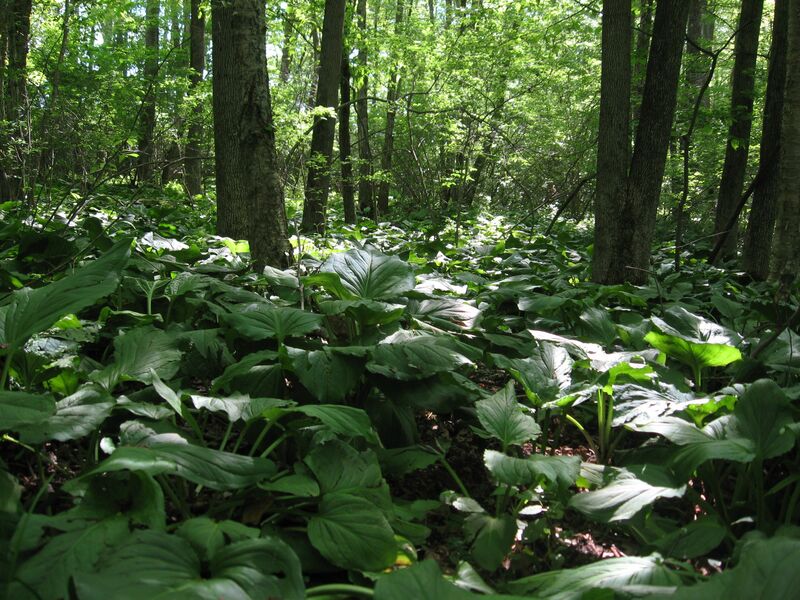 All of our discussions and explorations of plants and the botanical world ultimately are about diverse and sustainable ecosystems. An ecosystem that can sustain a magnificent wild creature such as the Manatee is supported by a multitude of native lifeforms- ultimately by a few key plants such as certain native seagrasses that require very specific environments to survive. 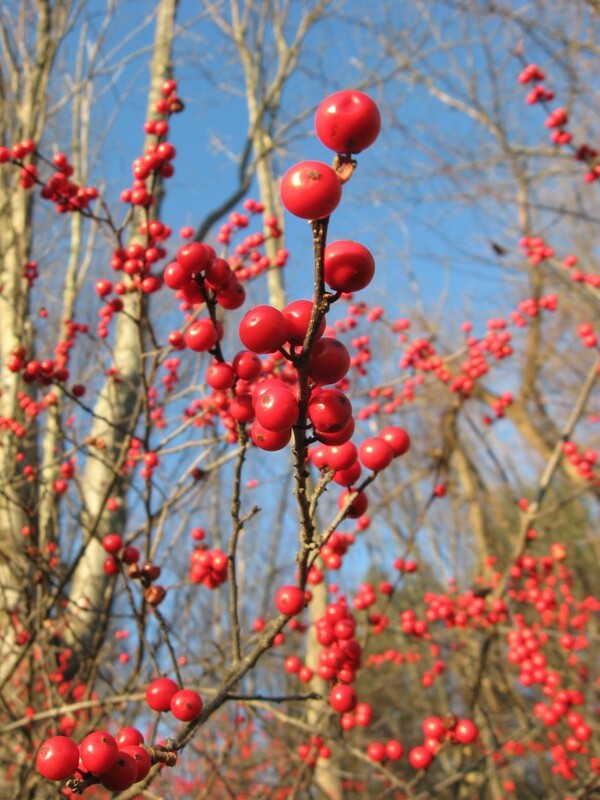 Sustaining our beloved native animals and birds are the native plants they have evolved to depend on. Thinking about how we impact the habitats of these plants is a great way to approach our strategy to save the animals and birds. 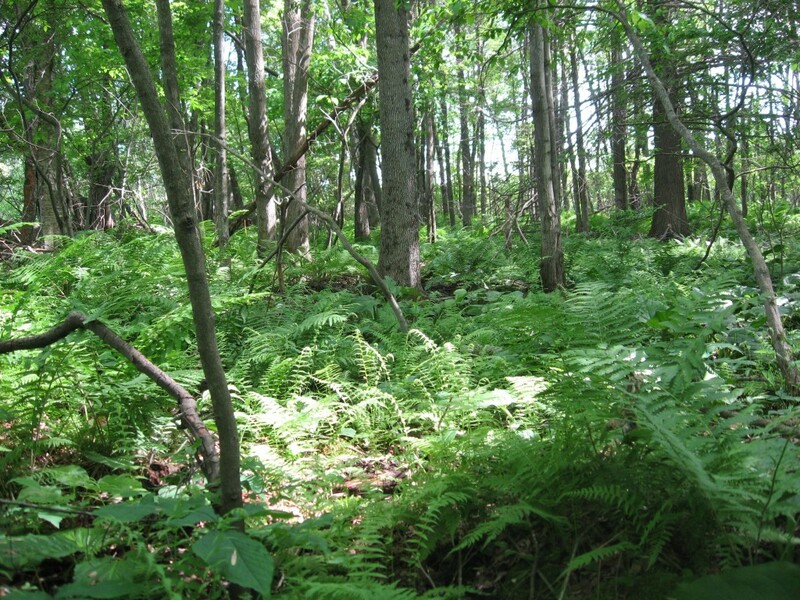 If we can sustain the native plants of an indigenous ecosystem, then we are well on our way to maintaining the more complex fauna that we value in our environment. This approach is one easier to comprehend and implement. If what we are doing is killing the plants, then the animals and birds are going to die too. The number one human activity that is causing the threat of extinction to the Manatee is the loss of habitat. 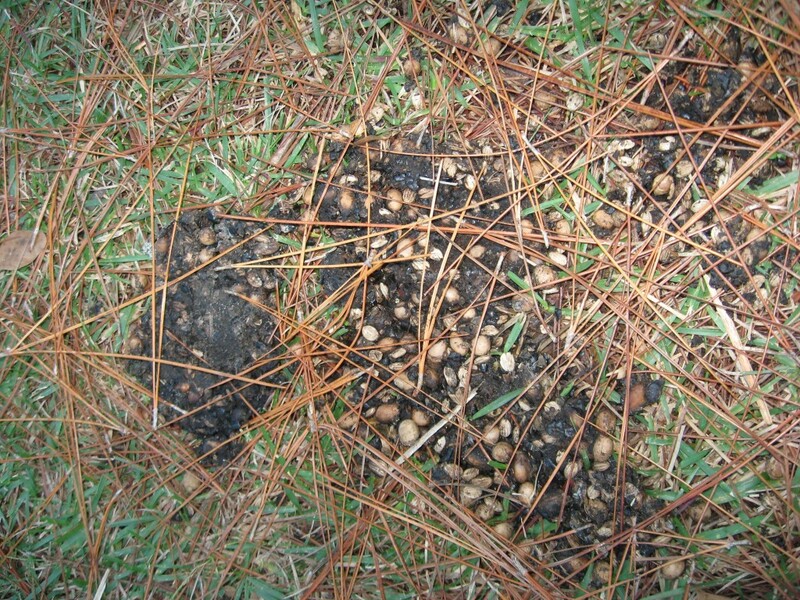 This is from overdevelopment that is killing off the habitats of the native seagrasses the Manatees depend on for food. This next picture was taken just moments from the previous one of the full Manatee. Here we see the trees- The bald cypress, the ferns, a shrub layer and the water. Reflecting upon all of this is an ecosystem that has existed for millennia, with a fossil record to back up this fact. 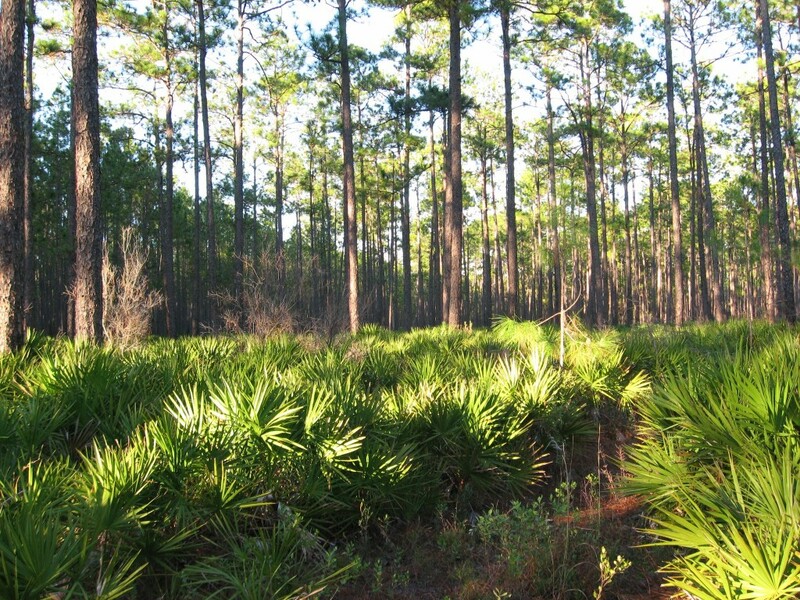 Here it is, a part of the continuum, perhaps a vestige, but we still have it in our world, right here in our Florida. In the two pictures above, there can bee seen a mass of green in the water. 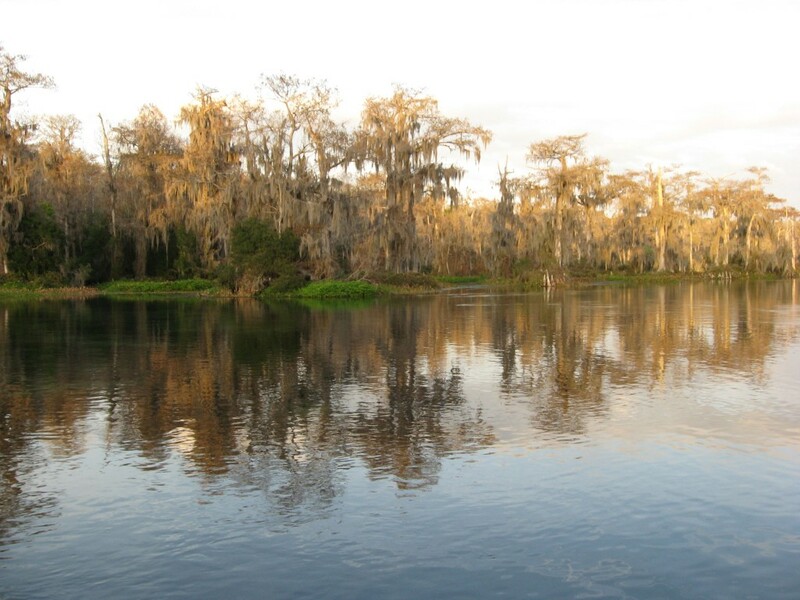 Much of this is an invasive plant called Hydrilla, which is a huge problem in Florida waters. It originated as an aquarium plant that escaped, most likely from aquariums being dumped into the water. The Park Ranger explained to us how these grasses have taken over and have crowded out much of the native plant life in the Wakulla River. In an interesting twist of events, the herbivorous Manatees are eating the Hydrilla! It would be interesting to find out if they really like it, whether it provides them enough nutrition, or if they have no choice but to eat it for survival, since it has replaced the native grasses. 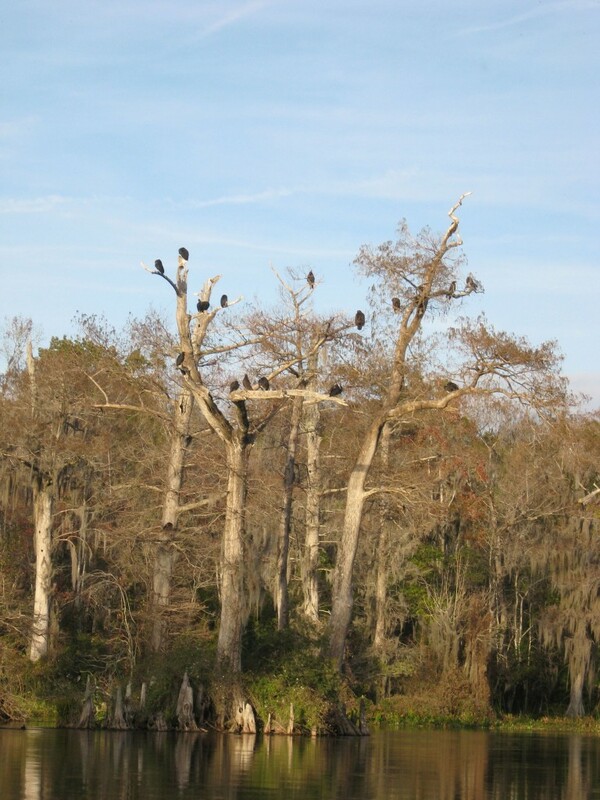 In Wakulla Springs you can see a tree full of Turkey vultures and waters teeming with Manatees-Mammals ten feet in length that spend most of their time eating, resting and traveling! 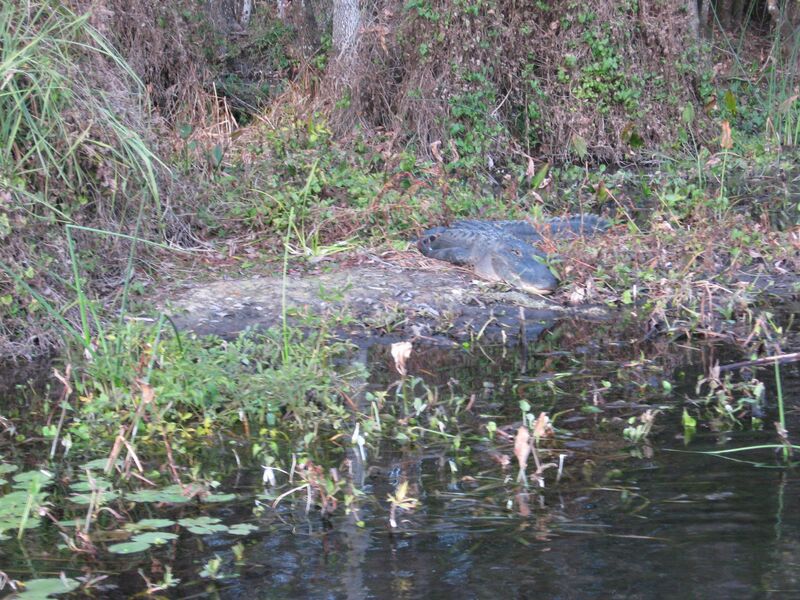 It takes alot of ecosystem to support complex and large beings, like this Alligator. And here we have an Anhinga that has dried out its wings and is just satisfied relaxing on this old tree branch. You can write back on this postcard! Let us know your thoughts on our comment box!